A Dark Web website is trying to raise money and gather expert advice with a view to allegedly assassinating President-elect Donald Trump and Vice-President-elect Mike Pence. 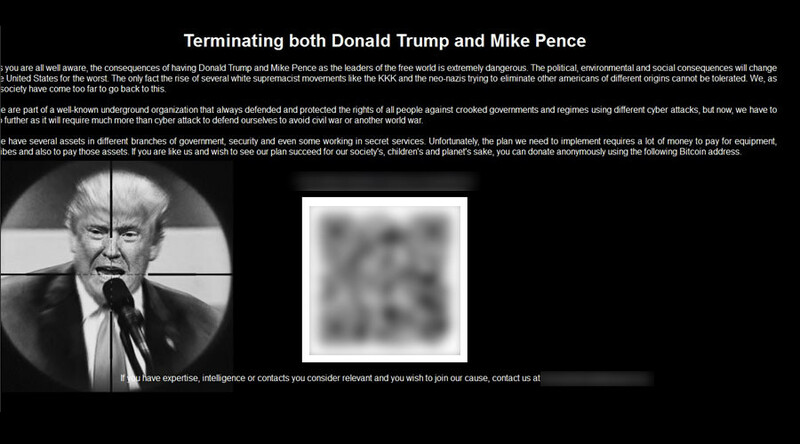 The site, which CSO reports went live last week, calls for assistance to fund an assassination attempt against Trump, and features an image of the president-elect in crosshairs. The website is located on the Dark Web, and can be accessed only using the Tor browser, which masks IP addresses. The Bitcoin wallet associated with the site has received $88,000 since March, but as the website has only been live for about a week, donations thought to be related to the assassination fundraising only amount to $119, CSO reports. According to the website's source code, a hacker has claimed they know who is behind the site, reported the International Business Times. Branding the website's host "a little scammer," the hacker says the person is a Canadian citizen. "I actually planned to send an email to the United States Secret Service about him, but I can't find an appropriate email address of the USSS," the hacker said. It’s understood the Secret Service has been informed about the website’s existence.